We are born in the Northern parts of the continent. In the dark midwinter we came to the enlightenment that hard rock had all the ingredients that could give us the freedom to express all our artistic thoughts in: music, lyrics and arts. Hard rock became Heavy Metal where we could let our energy flow and inspiration flourish into wild creations. In the northern parts of the European continent, the climate brings about a certain mood within people. The long, grim winters during the late sixties and early seventies brought about a strange desire for freedom and creative outlets within us, the two brothers growing up. Already in 1969 we were struck by the immense, mesmerising power of hard rock from artists like Jimmy Hendrix, Led Zeppelin, Black Sabbath and Deep Purple. In the dark, grim winter of 1974 it dawned upon us that by playing hard rock, in its heavier forms, we could actually express what we felt in our hearts. It gave us an avenue to express all our artistic desires not only music wise, but within lyrics and artwork, as well. We could let our energy flow and inspirations flourish and manifest themselves in wild creations. 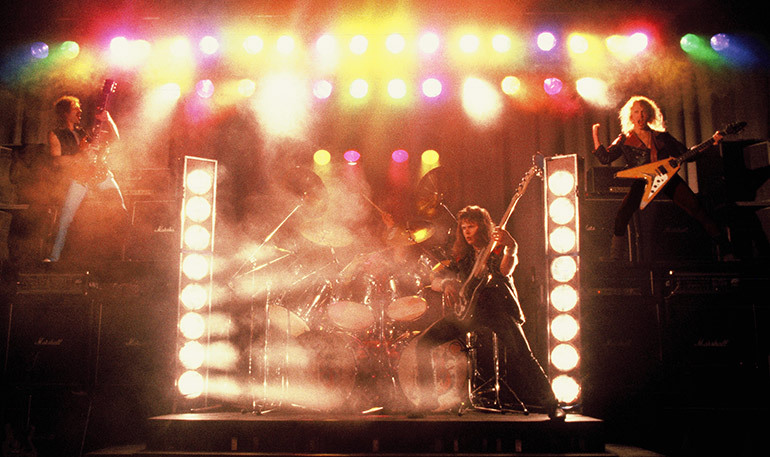 Wild creations that turned out to be heavy metal – in music, artworks and live performances. Already in our childhood, the Viking past of Sweden and its myths had been a great inspiration. Walking around in the woods here up in the north, you can somehow feel the presence of the past, the people and their fates. With this inspiration reverberating within us, we wrote several lyrics with Viking themes already in 1974/1975. Styrbjörn wrote the lyrics of our first Viking song “Son of the Northern Light”. We played it at our first concerts in 1976. In 1978, it was included on our first album Full Speed at High Level. We, the Wahlquist brothers, grew up in a family where music was, and still is, an essential part. Some of our for-fathers were much into music with composing, writing poems and performing. Grandfather´s grandfather, on our father´s side, was an organist and composed several musical works. In our grandfathers family music was something the family gathered around with lots of singing in harmonies and composing. Having three sons and one daughter and a wife with a beautiful soprano there was almost no limit to the harmonies they could accomplish and Grandfather and grandmother, shifted taking playing the grand piano. Ingemar Wahlquist, our father and the oldest of the children, did vocal solo performances at the age of four. It was immensely appreciated and he was called the angel, having curly blond hair falling over his shoulders. Later he had singing and playing the grand piano as his main vocation. We boys had countless and very memorable moments together with him singing and laughing. Orphei drängar is one of the most successful male choirs of all times and Ingemar was first tenor in that choir for many years [more about Orphei drängar]. He also had plans for becoming an opera singer but instead he turned to law due to the economic uncertainties of the life of artists. Our mother was very much into literature and poetry and often quoted poems for us as kids, her own or others. She wrote beautiful poems but she had no ambition to get them published. Our father painted as well and had a cousin that was quite a famous painter; in addition, our paternal grandmother was much into creating embroidery with very artistic motives. Maybe this was a seedbed that formed our artistic side. Growing up in this milieu was very inspirational and educating when it comes to the discipline of the arts; especially music and lyrics. We started fooling around at a very early age. Styrbjörn´s first drum kit came about by his emptying the pottery cabinet. Ragne got his first guitar at an early age, it was acoustic but who cared. It did not stop us from going on stage, in the kitchen. We had great fun, were happy playing our hearts out. The neighbours were not quite as happy though. The name for this fantastic constellation of a band was “The Horses”. As mentioned before, already at an early age we both had a fascination for history and ancient times; the heroes from the myths and sagas of mankind. We had a country place out in the woods where we spent much time during the holidays. Here we let our imagination flourish and assumed the roles of the old heroes. This country place was situated in old Viking country with rune stones to be found. This environment had a great influence on our imagination and inspired us to take part of the history and the myths of the ancient Vikings. Nowadays Ragne lives in an old villa from the 18th century located by one of the rivers that once was a Viking route stretching from the Baltic Sea to the ancient town of Uppsala. Uppsala was one of the most holy places for the Vikings in this part of the country. Where this river flows into the Baltic, not far from Ragne’s home, the Vikings had an important trading post. There are many Viking graves in this part of the country and at excavations interesting artefacts are often found. Walking along this ancient river, one can almost hear the oars striking the water and the wind fluttering the sails. Sometimes there is some kind of magic in the air actually, especially in the early mornings when the fog flows in from the sea; it is as if there are fairies dancing on the surface of the river. Sometimes the sun’s rays filter through the leafage of the ancient oaks. Some of them are from the Viking era and they have dramatic stories of the past and the future to tell. We began as a trio in 1974 - 75 with Michael Bachler on bass guitar. The first concert was during the winter of 1976, in Stockholm. Michael and we, the brothers, had different visions for the future and decided to part. Soon we found Dan Molén, the bass guitarist who would come to play on Full Speed at High Level. After about a year, having participated in our first tour, he wanted to focus on his family instead. Once again we had to search for a bass guitarist. There was still one more line up before what is held as the classic line up finally came about. 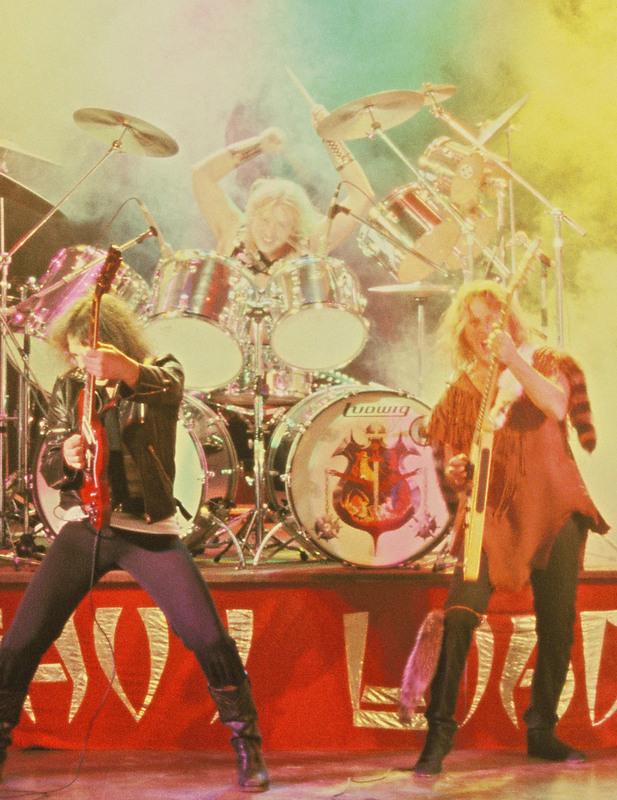 This was the first time Heavy Load would have a line up of four members; one that were including a second guitarist. We had almost a year with this other guitarist, Leif ”Lillen” Liljegren who later joined Treat for some time [more about Treat]. This line up also included Eero Koivisto on bass guitar. In time Eero would turn to design and became a successful architect [more about Eero]. We never did any high class recordings with these guys and of course nothing was released. We did a couple of concerts that were much appreciated though. Torbjörn Ragnesjö is our cousin; our mother and his father were siblings. We were like a big family spending holidays and weekends together and one can say that we grew up together. Of course we had played and jammed from time to time. We brothers felt that now it´s time, let’s try Torbjörn to see what comes out of it. We found that it was the right thing for our music. But, still we needed a second guitarist and one night we checked out Eddy Malm as he was performing with his band at the time, Highbrow. We were impressed with his action on stage and it all ended up with him joining Heavy Load. With these two gentlemen, Heavy Load had a lasting line up until the winter of 1984-85. Torbjörn married and in time he had three sons. He wanted to focus more on his family and was not conformable with the success and time consuming future of Heavy Load. After Torbjörn, a young and very enthusiastic guy joined the band, namely Andreas Fritz. During the summer of 1985 we were out on what turned out to be our last tour, called ”The Monster Tour”. Andreas fitted the band perfectly; he had a lot of energy while performing on stage and his playing was very inspired. Monster Tour, 1985, with Andreas Fritz on bass guitar. After about a year, however, Andreas wanted to follow his own path in music which had other goals than those of Heavy Load. We are still good friends and keep in contact and when we meet there are many nice memories to rejoice in. Eddy decided to go his own way the same year. We are good friends with Eddy and we meet frequently. His time with Heavy Load was valuable to us and also on a personal level. Eddy has his Eddy Malm Band now and they released an album in December 2016, Northern Lights [more about EM-Band]. After a short while, we found two new brothers in arms in the guitarist, Patrick Karlsson; and the bass guitarist Paul Grey (former UFO). We never did any proper recordings or concerts though. Before long, we brothers became busy recording albums with other bands and one night everything grinded to a halt; our studio was flooded and almost everything was destroyed, but this is a totally different story.